When it comes to lighting your scenes with an HDR, it’s easy just to find one online and start lighting away. Some information that isn’t as widely spread though, is the importance of a good quality HDR image. In this article, we’ll look at how to measure an HDR image and determine if it’s suitable to get good lighting from. We’ll also look at the difference in lighting between good and bad HDR’s, and what you can achieve by creating your own. The custom HDR's created for this article are available to download at the end of this post. When using HDR, it’s all about dynamic range. So, what is it exactly? The dynamic range of an image describes how many stops of light have been captured. The higher this is, the more information your render engine will have to light your scene, giving you better shadow detail, resulting in an overall better looking image. Using an application such as HDRSoft’s Photomatix Pro, we can look at the HDR levels of our image and determine how much dynamic range is contained within it. These are screenshots of the “HDR Curve” window in Photomatix Pro. 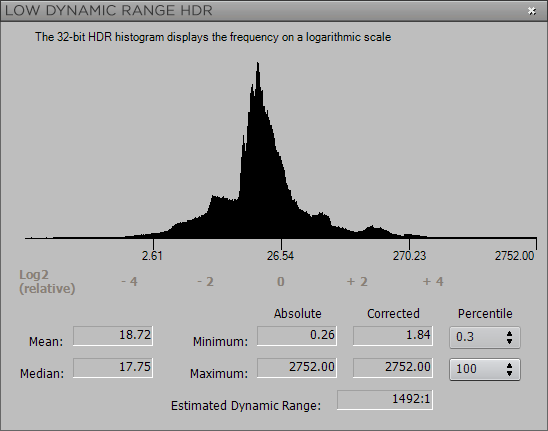 The “Estimated Dynamic Range” gives us an idea of how much information has been captured within the image. The more range we have, the better the shadow detail in the resulting render. 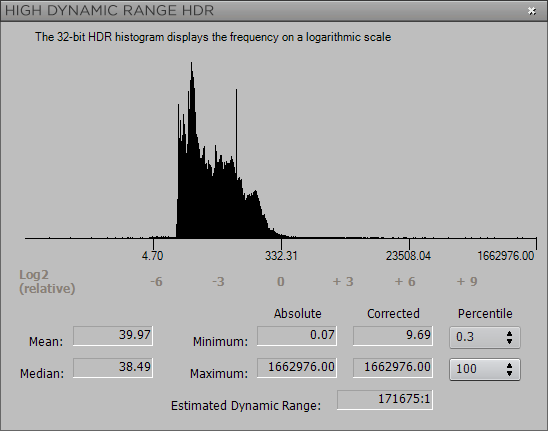 In the images, we can see the “Estimated Dynamic Range”. In the first image we have a reasonably low range, while the second one is a lot higher. Now that we’ve gone over the theory behind all this, let’s look at a practical example. The following examples have each been rendered three times. First with the low range image, then with the high range image, and a third time with a “corrected” low range image. The corrected image has had a gamma correction applied. (Inverse gamma value of 0.65 in the VrayHDRI map) This increases the shadow darkness (though they’ll stay blurry), but messes with the actual lighting. While this hack can help you in a pinch, you’re better off looking for a better image in the first place. Both HDR’s are of a sunny daylight scene,where the sun is shining without obstructions. As you can see, the first image has very undefined shadows. A bright, sunny day would produce sharper, more defined shadows, as seen in the second image. Here we have a more realistic looking lighting thanks to the range in the second HDRi. Then lastly, we can see the corrected image which has darker shadows, but still less defined. Also note the lighting has taken on a different tint compared to the first image. 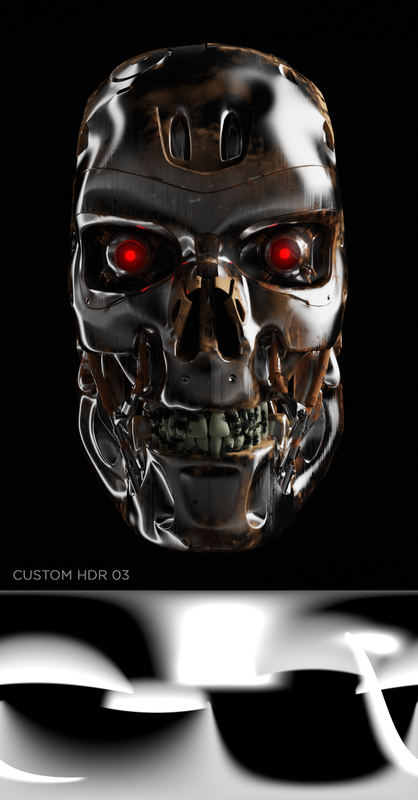 Now let’s have a look at what a custom HDR can do for a studio scene. Now that we’ve had a look at lighting, we’ll focus more on reflections in this part. As a test, I grabbed a T800 head model from user MarcuSCatu89 on Turbosquid and weathered it a bit, for a more stylized look. This also shows the importance of the reflections in our scene. For the first image, I used a downloaded HDR from user zbyg’s packs on deviantArt. For the others, I created custom ones using HDR Light Studio. While the results of the first image look pretty good, it only took me about 15 minutes apiece to make the custom HDR’s. HDR Light Studio’s Lightpaint feature makes it really quick to get the reflections just where your want them. It makes working on studio shots a breeze. I highly recommend taking a look at it if this is the kind of work you’re doing. 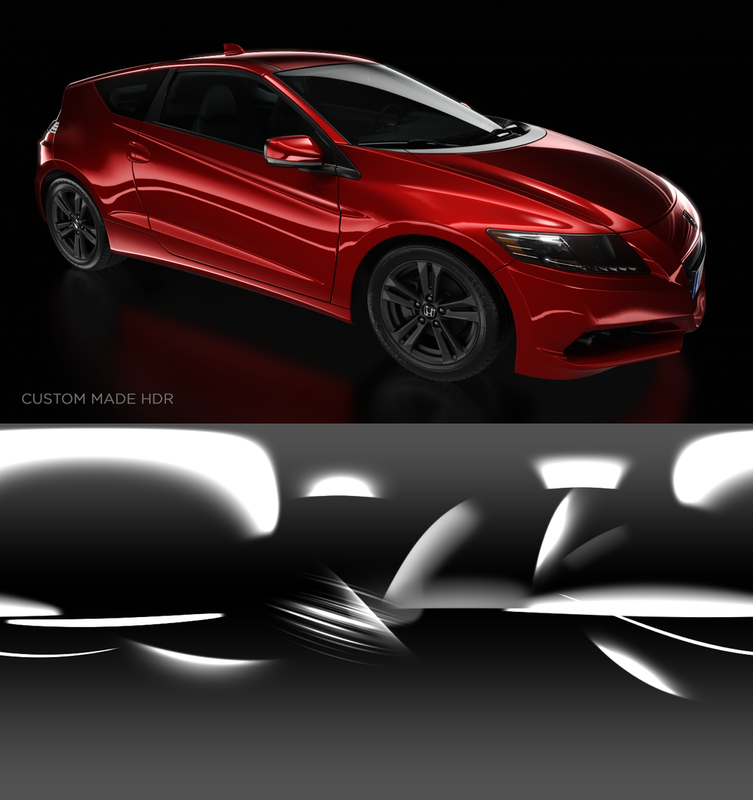 Another example of a custom HDR really helping to sell your image is in automotive rendering. Again, the first image was rendered with the downloaded studio HDR. The second was rendered with another custom HDR created in HDR Light Studio, again made in about 15 mins. Even after such a short time, you get get some pretty good results. So, where can you find these outdoor HDR’s that have a large dynamic range? Some great ones can be found at CG Source (a free 1K sample was used in this article). These are commercial HDR’s, but the quality of them is amazing. Click here to download all the “custom made” HDR’s from this article.